Eating a hearty breakfast has many pluses. It keeps your blood sugar constant…no mid-morning or afternoon snacking. Studies have shown that people who eat a good breakfast tend to weigh less. Children do better at school. 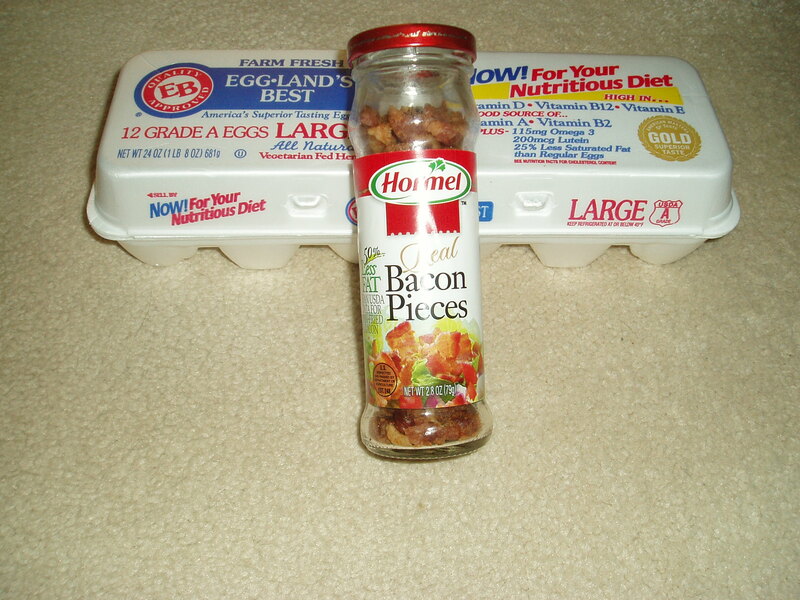 Best thing is breakfast food items are some the least expensive at the store. So why do so many of us skip the most important meal of the day? Probably because we don’t have time or find the same old foods boring. Here are some of my ideas for breakfasts that can be put together either the night before or even prepared at the weekend for week long eating. I have to say I’ve always been a big fan of oatmeal. I know lots of people don’t share my enthusiasm for it but it’s inexpensive (shop the bulk bins and it’s even more of a bargain), and it fills you up. I prefer the old fashioned variety to the instant kind but didn’t want to spend time cooking it every morning. 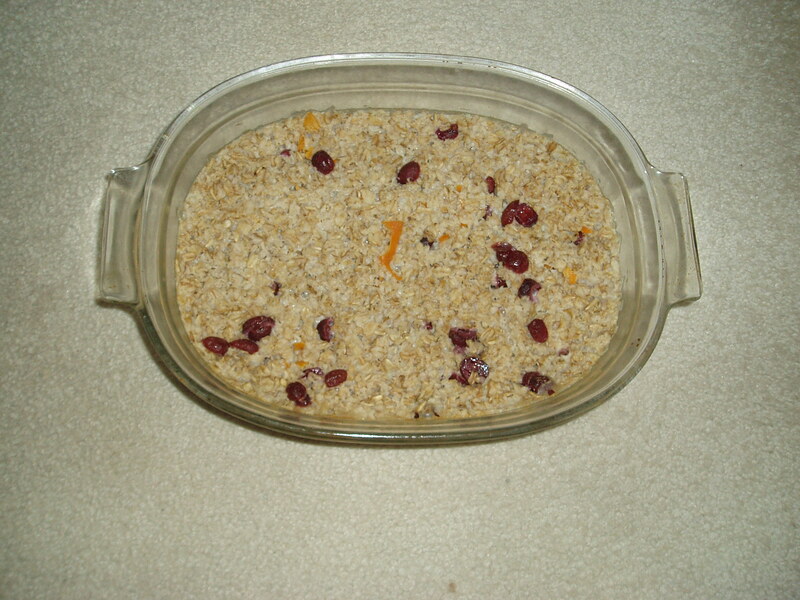 A few years ago I found a recipe for baked oatmeal. I tried it, liked it but over time I’ve adapted it to suit my own taste. It’s very simple to put together and each Sunday I make up a batch, store in the fridge and just heat it up each morning in the microwave. ¼ – ½ cup of brown sugar depending on how sweet you like your oatmeal. My philosophy is you can always add more but you can’t take it once the dish is made. A pinch of ground cardamom. I’ve used this instead of cinnamon because I think it pairs perfectly with orange and cranberry but if you don’t like it use cinnamon. And be careful with the cardamom because it is very pungent and can easily overwhelm all other flavors. 3 ¾ cups of liquid…it’s your choice if you want to go with all milk or a combination of milk and water. I’ve found you should use at least one cup of milk for a creamier consistency. Spray a large casserole dish with cooking spray and add everything and give it a stir so all the ingredients get evenly distributed. Bake in a 375 degree oven for 40-45 minutes or until it’s set and lightly browned. As you can see from the photo it set solid and doesn’t look like your usual bowl of oatmeal so each morning spoon some into a bowl and heat it in the microwave for about a minute and then add more milk. Remember the book I was reading just before the holidays called Healthy Mixes?They have a great section on breakfast items and one that caught my eye was the baked eggs you can freeze and use whenever. 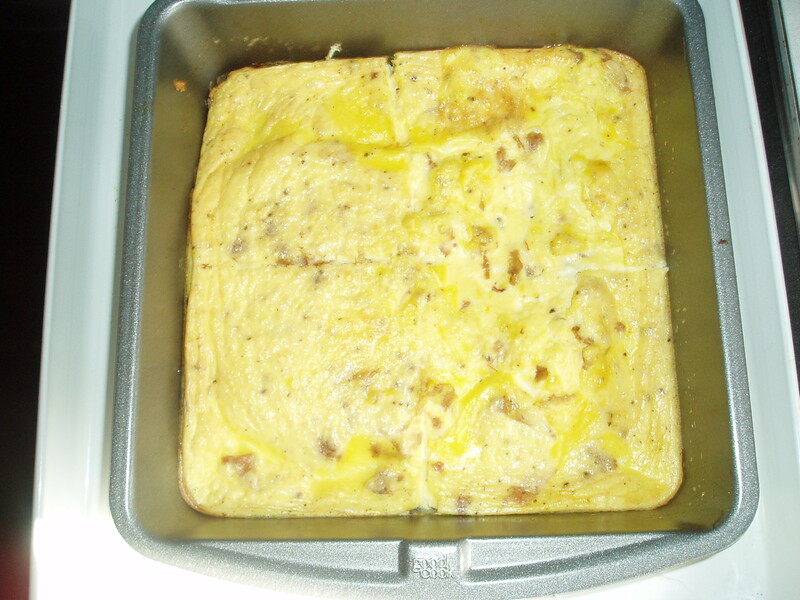 It’s just eggs with water baked in a pan and then cut into individual portions and add a slice of bacon and cheese. I thought I’d cut that chore down even more and here is a batch I made the other day by adding bacon pieces and shredded cheese. This batch used six eggs, twelve tablespoons of water, cracked pepper, half a jar of bacon pieces and about 1/3 cup shredded cheese. It cooks in a 375 degree oven for about 20-25 minutes. I’m also thinking about a cheese and chili egg mix and a cheese and salsa one too. Defrost one the night before or in the microwave, add an English muffin and you’ve got breakfast on the run or even an easy lunch. No matter what restaurant I go to if a breakfast burritos is on the menu I order it. And they’re simple to put together at home. I use scrambled eggs, black beans, cheese and salsa, roll everything up in a tortilla and microwave just long enough to heat it through and melt the cheese. Another one of my favorite picks is huevos rancheros. Tortillas, fried eggs, beans, salsa, sour cream and if you like it, some cilantro too. One of my other favorite fast breakfast meals is the PB and J sandwich. Try different jams like blueberry or peach for something different each morning. And who says it has to be on bread. I’ve made PB and J sandwiches using waffles. They’re great with PB and sliced bananas too. And yes, if you really want to splurge, melted chocolate drizzled over them as well.